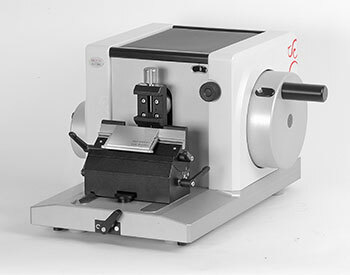 A Manual Rotary Microtome with blade holder for disposable blades or steel knife holder. This manual rotary microtomes offer sophisticated features for precise sectioning of paraffin embedded specimen for medical, biological and industrial applications to guarantee an efficient and precise workflow. The rotation of the hand wheel is light and smooth ensures an ergonomic handling of the instrument, which greatly reduces the operator’s intensity in the sectioning job. The hand wheel locking is conveniently integrated in the wheel and designed for one thumb use. Section thickness can be adjusted between 0.5 µm and 60 µm and the compact and ergonomic design integrates a comfortable storage area for different handling tools.